Three space station fliers floated into their Soyuz ferry craft, undocked from the lab complex and plunged back to Earth Friday, making a rare nighttime landing in snowy Kazakhstan to close out a 141-day stay in orbit. With Soyuz TMA-17M commander Oleg Kononenko at the controls in the descent module’s center seat, flanked on the left by flight engineer/co-pilot Kimiya Yui and on the right by NASA astronaut Kjell Lindgren, the descent module settled to a jarring parachute-and-rocket-assisted touchdown around 8:12 a.m. EST (GMT-5; 7:12 p.m. local time). Coming down in darkness an hour and a half after sunset, dropping through high winds, low clouds and light snow under a large parachute, the Soyuz descent module was not seen before touchdown. Recovery crews reported the spacecraft ended up on its side, not unusual in windy conditions. Braving drifting snow and a wind chill around 10 degrees Fahrenheit, the recovery team quickly reached the spacecraft to help the crew members out of the cramped module as they began their re-adjustment to the unfamiliar tug of Earth’s gravity. 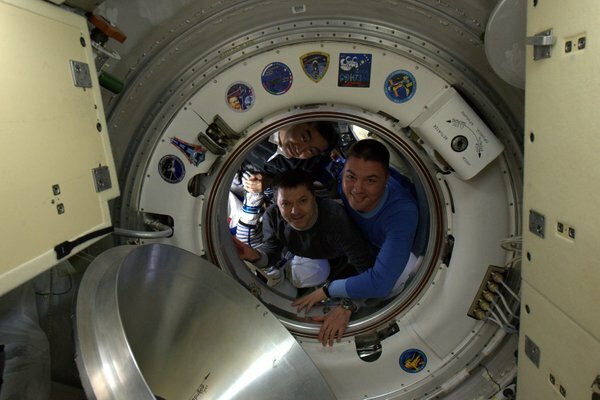 Kononenko, with two previous station visits to his credit, has now logged more than 533 days in space while Lindgren and Yui, both making their first flight, logged 141 days and 16 hours. The mission spanned 2,256 orbits and 59.6 million miles. “They arrived in space like baby birds barely able to fly & now they soar home as eagles,” station commander Scott Kelly tweeted from orbit, referring to Yui and Lindgren. “Great job Kjell and Kimiya! Following standard procedure, Kononenko, Yui and Lindgren were carried to nearby recliners and covered in heavy blankets for quick medical checks and satellite phone calls to friends and family. By the time a live video feed was established, Kononenko had already been carried to a waiting all terrain vehicle. Yui and Lindgren quickly followed suit, smiling and waving at the camera as they were carried away. Because of the dismal weather, the Russians opted to forego setting up a medical tent at the landing site to expedite the crew’s departure to nearby Dzhezkazgan. From there, Kononenko will be flown back to Star City near Moscow while Lindgren and Yui will board a NASA jet for the long flight back to the Johnson Space Center in Houston. With the Soyuz TMA-17M crew safely back on the Earth, Russian space engineers will quickly shift gears, setting their sights on launching three fresh station crew members on Tuesday to boost the lab’s crew back to six. 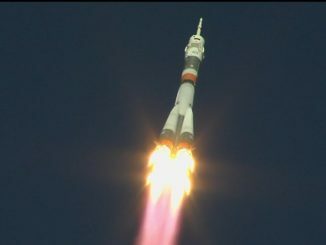 Soyuz TMA-19M commander Yuri Malenchenko, flight engineer/co-pilot Timothy Kopra and European Space Agency astronaut Timothy Peake, the first British citizen tapped for a long-duration stay in space, are scheduled for launch from the Baikonur Cosmodrome at 6:03 a.m. Tuesday, kicking off a six-hour four-orbit rendezvous. Standing by to welcome them aboard will be Expedition 45 commander Scott Kelly, Mikhail Kornienko and Sergey Volkov. Kelly and Kornienko are in the home stretch of a nearly yearlong stay aboard the station, scheduled to return to Earth with Volkov on March 1. Malenchenko and Kopra are station veterans while Peake will be making his first flight. All three will have to hit the deck running, getting their space legs and helping unload an Orbital ATK Cygnus cargo ship that arrived Wednesday carrying 7,700 pounds of equipment and supplies. A Russian Progress supply ship is scheduled for launch Dec. 21, arriving at the space station two days later. 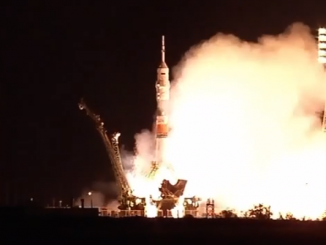 The Soyuz TMA-17M return to Earth began with undocking from the station’s Rassvet module at 4:49 a.m.
After backing away to a distance of about 12 miles from the station, Kononenko monitored an automated four-minute 40-second deorbit rocket firing starting at 7:19 a.m., slowing the ship by about 286 mph and dropping the far side of the ship’s orbit deep into the atmosphere to initiate re-entry. Twenty-two minutes later, after descending to an altitude of about 87 miles — just above the discernible atmosphere — the three modules making up the Soyuz spacecraft separated as planned. The central crew module, oriented heat shield first, slammed into the atmosphere about three minutes later, enduring about five minutes of extreme heating and four to five times the normal force of gravity during a fast plunge into the thick, lower atmosphere. The capsule’s braking parachute was programmed to unfurl at an altitude of around 6.6 miles. From there to touchdown took about 12 minutes. 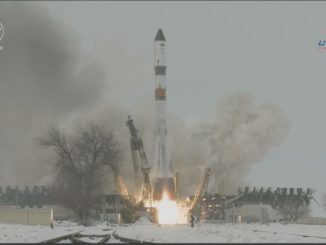 This was only the sixth Soyuz night landing in station history and while the Russians prefer daylight returns for better visibility, ground teams train for landing in all lighting and weather conditions and the TMA-17M recovery appeared to go off without a hitch.